You all know how obsessed I am with margaritas. So the only reasonable thing to do for the holiday season was to — of course whip up a cranberry margaritas recipe! Cheers to that! I happen to have also been on a bit of a cranberry juice kick lately. I somehow rediscovered Grape Nuts this year, and my favorite thing to pair with them for breakfast is a nice iced glass of cranberry juice. (And for what it’s worth, I highly recommend the 100% not-from-concentrate Simply Cranberry Cocktail. Delish!). 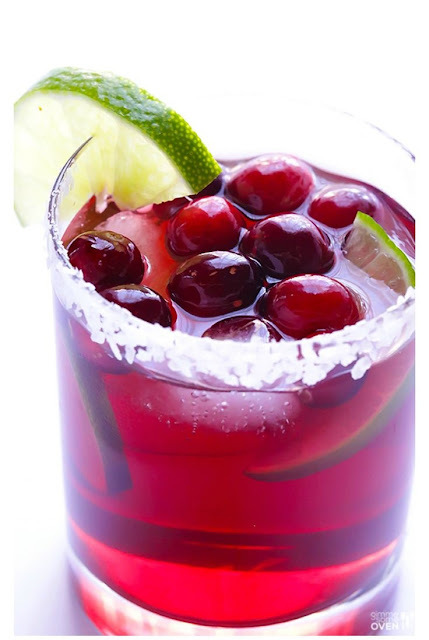 So when happy hour arrived yesterday, I decided to take a shortcut and just whip up a batch of cranberry margaritas using store-bought cranberry juice, and freshly squeezed lime juice.